Aren’t you just jonesing for a good red carpet? Awards Season ended weeks ago, feels like years ago. And we have a month—a long month—to wait until the Cannes Film Festival begins on Tuesday, May 8. The good, no, make that great news is, there is going to be some of the best jewelry at Cannes ever. How do I know? Well, Cate Blanchett is the Jury President, which means she will be attending almost every movie premiere, plus a few photocalls and other parties for 10-days. This transforms Cannes, always a big jewelry event, into something for this jewelry journalist almost on a par with the royal wedding on May 19. Few stars are as studied in their style as Blanchett. I feel she handles her red-carpet moments as seriously as her range of roles. She takes risks and wears jewelry that is feminine with a touch of edge. In the past, she has focused on a couple of the best designer names on the planet—namely Van Cleef & Arpels and Chopard—and has really worked those stunning collections. Take a look back at just how magnificently the star has coordinated her jewels with her dresses and gowns at Cannes over the years and mark your calendar for the splendor to come. In 2010 for the Cannes premiere of Robin Hood, Blanchett wore a dress emblazoned with a silver eagle by Alexander McQueen. The lyrical gown was particularly poignant as the designer had personally chosen it for the star before he died a couple of months prior to the film festival. Blanchett paired the gown with Van Cleef & Arpels Bird of Paradise diamond earrings that echoed the motif of the dress. She also wore two vintage platinum and diamond Ludo bracelets made in the 1930s. At the 2010 photo calls for her film Robin Hood, Blanchett wore vintage Van Cleef & Arpels jewels with a blush pink couture suit from Armani. If you thought front to back earrings were a modern invention this view of these spectacular gold and diamond vintage tassels by Van Cleef & Arpels proves the style has been around for decades. It also shows how very innovative the French jeweler has always been. In 2015 for the Cannes premiere of Sicario, Blanchett chose a dramatic Armani Privé black gown and a historic pair of vintage Van Cleef & Arpels cuffs to wear on the red carpet. The 1970s hammered gold designs was inspired by the cratered surface of the moon, seen all over the world on TV for the first time in 1969 when NASA astronauts landed on the surface. Jackie Kennedy famously owned a pair of these Van Cleef jewels. In 2014 at the Chopard Trophy Ceremony honoring young talent, Blanchett appeared in two different equally stunning outfits and nature inspired jewels. She paired Chopard shrimp earrings with a Valentino gown for the ceremony. The 18K gold crustaceans were set with black and white diamonds, blue, lavender and brown sapphires among other gems. Blanchett changed at the ceremony into a green Armani Privé dress and an astonishing Chopard flower necklace with 65.66 carats of green tsavorites and 15.57 carats of pink sapphires, rubies, and diamonds and 15.57 carats of pink sapphires, rubies, and diamonds and a 92-carat Rubelite cocktail ring. For the Cannes 2010 premiere of How to Train Your Dragon, Blanchett wore a Givenchy gown with sapphire and diamond earrings from Chopard that echoed the scales on the creature in the film. If you have any question whatsoever about the intentional theme dressing Blanchett executes at a couture level, I have just one final photo for you. 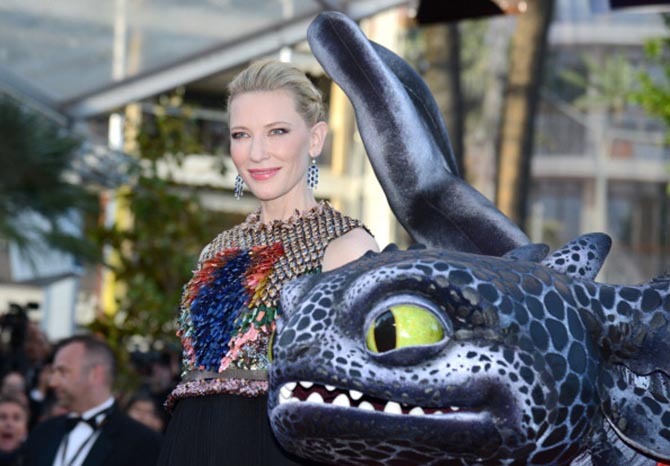 Take a look at the Chopard Paraíba tourmaline ring she paired with the scaley Givenchy for the How to Train Your Dragon premiere. It is a pure fantasy creature jewel.